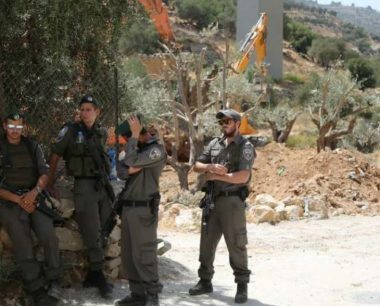 Several Israeli military vehicles, accompanied by a bulldozer, invaded Palestinian orchards, on Tuesday morning, and uprooted 18 olive trees, in Deir Ballout, in the West Bank governorate of Salfit. The invasion was carried out into orchards in the southern part of Deir Ballout village, after the soldier surrounded them. The Palestinian News & Info Agency (WAFA) said the soldiers are trying to prepare for installing new water pipelines, to link them with nearby illegal colonies, built on privately-owned Palestinian lands. Also Tuesday, the soldiers abducted two Palestinians from the northern West Bank governorate of Tulkarem; one was abducted at a roadblock near Qalqilia, and one from his work in Jerusalem. The soldiers also detained two photojournalists, working for the WAFA Palestinian news agency, and the Palestinian Broadcasting Corporation (PBC), in Hebron’s Old City of Hebron, in the southern part of the occupied West Bank. On Monday at night, the soldiers abducted a young Palestinian man in occupied East Jerusalem, after dozens of soldiers invaded the courtyards of the Al-Aqsa Mosque, amidst extensive military deployment in the area.